I was disappointed to see that Hewlett Packard Enterprise has decided to remove the old SGI STL documentation from its website. Although rather old, I thought the documentation was the best introduction to the STL available. Standard Template Library Programmer’s Guide. I hope you find it as useful as I do. Update: Justin has put the documentation on GitHub here: sgi-stl-docs. Thanks, Justin! Combinatorial algorithms are algorithms that deal with combinatorial structures, which are sets, ordered n-tuples, and any structures that can be built from them, like graphs. Needless to say, you could be in for a long wait, so this is not a feasible method, but every top-down parsing method is just a refinement of this, so it is interesting theoretically. As I have already written the algorithm to generate sentences from a grammar, the implementation of the parser is trivial. The only difficulty is that it’s hard to know how many sentences you need to generate to be sure of encountering the input sentence if it is valid, so I’ve added a max_gen parameter to specify the maximum number of sentences to generate. The algorithm to generate production trees from a grammar can be used in the same way. The only difference is that the sentence needs to be extracted from the trees for comparison. In a previous post, I showed how to generate sentences from a grammar. We can go further and generate production trees. 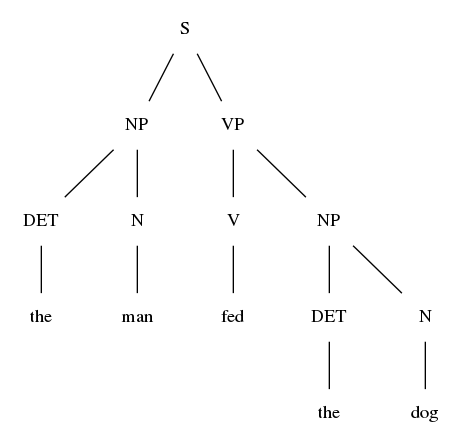 A production tree is just like a parse tree – it is a recursive decomposition of the grammatical structure of the sentence like the picture above. 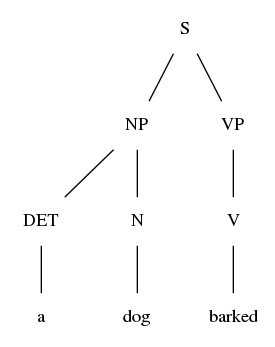 The main algorithm for generating production trees is just the same as for generating sentences – using a queue and breadth-first search – but instead of substituting right-hand side symbols in place of the first non-terminal in the sentential form, we append child nodes to the first non-terminal leaf node in the production tree. A depth-first search is used to find the first non-terminal leaf node. Once there are no non-terminal leaf nodes, the production tree is complete. The complete tree can be printed in the dot language and converted to a graphviz graph, like the picture above, or the sentence can be retrieved from it by using an in-order traversal to retrieve the leaf nodes, which in a completed tree are all of the terminals. Below is the code for the production tree, which is a Composite made of three classes, the abstract symbol class, and concrete subclasses nonterminal and terminal. The structure is pointer-based, so smart pointers are used throughout. The production tree generator is very similar to the sentence generator described previously, except production trees are copied and modified rather than sentential forms. Note that the queue, and consequent breadth-first search, are required because if the rule’s right-hand side is left-recursive, the algorithm would go into an infinite recursion without producing anything if it performed a depth-first search. Here is the code in C++, using the class I described earlier in Context-free grammar in C++. The generator class is instantiated with a grammar, and its generate() method will write n sentences to the supplied iterator, if n sentences can be generated. The Boost library has replace_all(), which does the replacement in-place, modifying the original string. The pystring library has replace(), which not surprisingly works the same way as the Python string.replace() method. This is the class I used for managing the grammar for the Unger, CYK, and Earley parsers. It will read a grammar from a file, and exposes the look-up methods needed by the various parsers, thus freeing them from needing to implement them themselves and allowing them to be used by different parsers. Symbols can be any length, not just single letters. Right-hand sides can contain any number of alternatives. Rather than using pipe separators, multiple rules can have the same left-hand side (subject). The subject of the first rule is considered to be the start symbol. Terminals are identified by virtue of not appearing on the left hand side of any rule. Is this symbol a terminal (doesn’t occur as the subject of a rule)? Notice how there is a look-up method for looking up rules given the left-hand side (get_rules_for_left()), and a couple of methods for looking up rules given the right-hand side (get_rules_for_symbols(), get_rules_for_symbol()). Which of these methods a parser uses is very telling about its manner of operation. The Unger parser, which is a top-down parser, looks up rules by their left-hand sides. The CYK parser, which is a bottom-up parser, looks up rules by their right-hand sides. The Earley parser, which is variously described as top-down, bottom-up, both, or neither, looks up rules both by their left- and right-hand sides. Below is the code in C++. A grammar object is instantiated from a std::ifstream. Rules are implemented using smart pointers to prevent unnecessary copies. // Is this symbol a terminal (doesn't occur as the subject of a rule)? // Is this symbol the left (subject) of a terminal? Unger’s method is a top down, non-directional, generalised parsing algorithm. Top-down means that the parsing process begins with the grammar’s start symbol and attempts to derive the input string by applying the production rules from the start rule downwards. Non-directional means that the input is not processed from left to right (or right to left), but instead is processed in arbitrary order. This requires that the entire input is in memory from the beginning. Generalised means that the parser can handle ambiguous grammars, which can produce sentences that have multiple correct parses. For each right-hand side, we count how many symbols it contains, and form of all of the partitions of the input into that number of parts. We reject any partitions that can’t possibly be correct because they don’t have terminals in cells that require them. So we reject all of the above except row #5, because it is the only one with the “+” in the right place. For the partitions that remain, we repeat the process for each cell of the partition, using the rules that can produce the symbol corresponding to that cell (the column header). So, in the example above, we repeat the process with “a * a” and all of the rules that can produce E, which is just “E -> E + T”. Here is the code in C++. The class unger_parser is instantiated with a grammar (see Context-free grammar in C++), and its parse method takes an input string which it will attempt to recognise, and will print the rules matched if given a std::ostream. As an example of the ambiguity of this grammar, consider the sentence “John called Mary from Denver”. Was John calling from Denver, or was Mary from Denver? The Earley algorithm uses three data structures, states, statelists, and the chart. A state represents a state in the process of evaluating a grammar rule. In particular, it represents how far along the right hand side of the rule the parse has progressed. This is usually represented as a dot between symbols of the right hand side showing the position, hence a state is sometimes known as a “dotted rule”. The position of the dot (represented by a “@”) indicates that the “Prep” has been processed and the “NP” should be next. The “3” and “4” are the positions within the input that the processed part of this state refers to (i.e., the span of the “Prep”). A statelist is an ordered list of states. The states in a statelist are unique, so it is sometimes called a state set. Once a state has been added to a statelist, it is never removed or modified – instead new states are created in this or the next statelist based on the state by the procedures described below. The chart is a set of statelists. There is one statelist for every point in the input, from before the first word to after the last. The statelists are generated one at a time as the parse progresses. There are only two statelists in action at any time, the current one being processed and the next one being generated. The algorithm processes the chart from the first statelist to the last, constructing the statelists ahead of itself as it goes. Rather than looping over the input, it loops over the statelists, the processing of which adds new statelists ahead of the iteration. The processing of states within the statelists consumes the input. There are three procedures, the Predictor, the Scanner, and the Completer. the dot is before the non-terminal “NP”, so the Predictor would process this state. The Scanner identifies states in the statelist where the dot is before a terminal (in other words, those states where the dot is to the left a symbol not processed by the Predictor). It reads the next word of input, and inserts a state into the next statelist containing the same rule with the dot moved past the terminal. The Completer processes those states not processed by the Predictor or Scanner, in other words, those in which the dot is at the right-hand end, after every symbol in the rule. These states are now complete. It finds states that have the left-hand symbol of those completed states on their right-hand side, and inserts states that are identical, except that the dot is moved to the other side of that particular symbol, as the completion of the original state represents the completion of this symbol. So the Completer’s job is to drive the dots forward in rules that are being processed. The Predictor and Completer insert states into the current statelist. The Scanner inserts states into the next statelist (because it advances the reading position). The Predictor and Completer are duals of each other and book-end the work of the Scanner. The Predictor moves down the grammar hierarchy to the bottom in order to introduce states with lower level rules. It feeds the Scanner by working its way down to the terminals and inserting states for their rules. The Completer moves up the grammar hierarchy to the top to advance the dots. It is propagating the work of the Scanner upwards, all the way to the start symbol. The parse is successful if the start state is in the last statelist, with the dot on the right of its right hand side. Below is the code in C++. The class earley_parser is instantiated with a grammar (see Context-free grammar in C++), and its parse() method attempts to recognise a sentence, and prints the statelists if it is passed a std::ostream. The Predictor, Scanner, and Completer are implemented as methods with those names. // An element of a statelist, also known as a "dotted rule" or "Earley item"
// Is dot all the way to the right? Here is the output. The entire chart is printed for each iteration. Notice how each iteration adds another statelist. The parsing process is a process of driving the dots forward. At the end of the parse, the presence of the completed start rule in the last statelist indicates success. I needed to do binary search of a sorted list with a custom comparator, something that isn’t supported by the Python standard library, so I’ve written a suite of functions for the purpose. They’re modeled on the C++ standard library functions lower_bound(), upper_bound(), equal_range(), and binary_search(). """Find the index of the first element in sequence >= value"""
"""Find the index of the first element in sequence > value"""
"""Find the range of sequence equal to value"""
"""Find out if value is in sequence"""